Writing – get into the habit. If you’re keen on any form of writing – from short stories to blog posts – then keeping a journal can help establish the habit of writing on a regular basis. Knowing that no-one but you will read your words means you needn’t worry about making them perfect. Some people prefer to write in a journal first thing in the morning, whilst fresh; others record their thoughts about the day just before bed. Insight – learn about yourself. We learn about the world outside us by reading, but we learn about the world inside by writing. If you keep a journal for any length of time, you’ll surprise yourself – especially if you look back over previous weeks and months. What topics obsess you? What patterns can’t you break? What resolutions do you constantly make on a Monday, only to have forgotten by Friday…? You could even use your journal to discover what your dream career is. Catharsis – work through problems. When faced with hard decisions that have to be made, writing can help solve them, giving you fresh ideas and perspectives. The result might only be that you accept the difficult times … or it might be that you realize a whole new aspect to the situation. 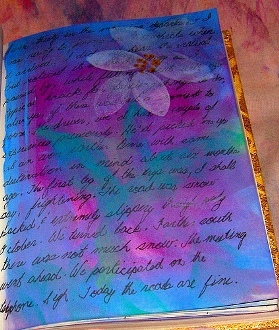 Like having a good cry, writing in a journal is cathartic, leaving you calmer and feeling more able to deal with things. Achievements – look back on what you’ve done. Sometimes, we look back on the weeks and months and wonder what actually happened. Were we just living on auto-pilot? If time seems to slip away from you, write down what you’ve achieved, on a regular basis. Perhaps it’s being entrusted with a new project at work, passing an exam, taking a new class, starting a project like a blog, a novel, a painting… Whenever you feel that you’ve not had a very successful month or year, read back over your journal. Record – your life and times. You may never become famous, but if you do, your journal (or excerpts from it) could well be published. You could even become well-known because of your journal. Think of the most famous diarist, Samuel Pepys; a 17th century Member of Parliament in the UK whose writings are now a hugely valuable source for historians … and an entertaining read for anyone interested in British history. Gift – for future generations. Perhaps your daily life seems humdrum and routine to you – but in fifty years’ time, it could be fascinating to your children and grandchildren. Just think how much life has changed since the 1950s … The clothes, entertainment, technology, food, politics and attitudes of today are all likely to be radically different in a few decades time. By investing a little effort in keeping a journal now, you could have something wonderful to pass on to descendents in the future. Pen and paper. This method has served dedicated journalers down the centuries: the humble pen and paper. Buy yourself a gorgeous notebook with lined pages, and a proper fountain pen – you’ll invest more time and emotion in your writing if you have good materials. Scribbling in scratchy pen on a cheap pad just isn’t the same. If you normally use a computer to write, do try writing by hand instead. You can take your journal anywhere (in the garden, in bed, in the bath), and having your words in a weighty, physical form makes them much more concrete than pixels on a screen. However, typing can have a slightly distancing effect – and it’s too easy to delete. One of the best things about journaling is capturing all those odd, half-formed or not-quite-right thoughts that come out, so resist the temptation to go back and editing them away. Don’t keep your journal as a blog. You’ll constantly be holding back, conscious of having an audience to impress or entertain, and you’ll lose most of the benefits of journaling. Keep your words for you alone, whilst writing them; if you choose to share them in future years, you can. Try keeping a journal for a week, writing every day for at least ten minutes. Stick to it even when you think you have nothing to say, when you’re tired, when there are hundreds of distractions clamoring for your time. After a week, see what effect it’s had. And if you already keep a journal, or if you’ve done so in the past, why not let us know us some of the benefits that it’s had for you? This was a guest post by Ali Hale, a freelance writer and web creator who — amongst other things — runs The Office Diet, a blog on healthy living for busy people.